Everything you need to properly service your timing belt. Complete kit includes only premium matched parts from Japanese OE/OEM manufacturers. These are the same parts used and trusted by Honda, Dealers and Technicians world-wide. Perfect Fit, Quality and Durability. This kit meets or exceeds original equipment specifications. (1998 1999 2000 2001 2002). All Models with 6 Cylinder / 3.0 Liter. (1998 1999 ___ 2001 2002 2003). All Models with 6 Cylinder / 3.0 & 3.2 Liter / V6. (1999 2000 2001 2002 2003). All Models with 6 Cylinder / 3.2 Liter. Includes The Following Brand New Parts. We also have the Hydraulic Tensioner. But these tensioners are expensive and rarely go bad, even after 250,000 miles. Save yourself a few bucks! 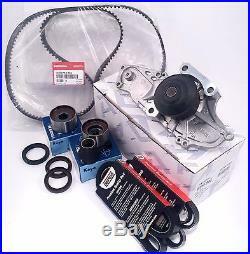 The item "New Premium Honda Accord / Acura CL TL V6 Timing Belt & Water Pump Kit AISIN" is in sale since Saturday, July 30, 2011.